This 76-foot luxury catamaran is nothing less than a feat of nautical engineering, customised to withstand the capricious weather conditions of the Cape, and purpose-built to host a range of corporate events, special occasions and private functions, big and small. The epitome of excellence, every sleek inch of this luxury marvel has been built with your enjoyment in mind – a vessel designed to take you beyond the ordinary, to a place of exceptional quality, consummate craftsmanship, and incomparable luxury. This stylish leisure catamaran is geared for everything from day sails where guests can hop overboard for swims at Clifton to fully catered sunset cruises, making it an ideal option for both leisure and corporate bookings. With its sleek good looks, it is sure to capture the imagination of the city’s A-listers and visitors to the city alike looking for good times on the water.continue reading…. From morning till noon till sunset, any time of day is the perfect time to set sail aboard the Mirage. So whether you prefer to start your day with five-star luxury, or end it with the ultimate in indulgence, the Mirage is ready and waiting to transport you to a place of pure relaxation. Step on board and you’ll immediately see why it holds the title of being the largest and safest private yacht in the V&A Waterfront – because with a meticulously constructed, wonderfully spacious layout, and a highly trained, responsive crew to attend to your every need, you’ll be able to stretch out and enjoy your sailing experience with complete peace of mind. If you’re feeling a little more adventurous, or simply want to enjoy the crisp sea air, the flybridge beckons, a perfect vantage point from which to take in unparalleled views of mountains above and dolphins below. And if you’re thirsty for more extravagance, simply make your way to the full service bar, stocked with bottled beverages, fine wines, and gourmet coffee. Stretch out on the ample double deck configuration, featuring a vast saloon area on the bridge deck level, and an expansive flybridge on the upper deck. Move upstairs to the flybridge, and revel in the prestige of it all, with VIP seating for 61 passengers, unobstructed views of the Cape’s breath-taking vistas, and a second bar for the ultimate in convenience, service and personal attention. Tantalise your taste buds with a delectable variety of gourmet cuisine, prepared on board in either the fully-equipped commercial grade kitchen, or its two large stainless steel outdoor grills on the aft deck. And above all, enjoy complete peace of mind thanks to the watertight safety features, designed and built to the highest code prescribed by South African Marine Safety Authority, Passenger Ship Class VI. If an occasion is worth celebrating, it’s worth celebrating in style. That’s their philosophy, and it’s one that’s seen them play host to a variety of luxurious functions, from birthdays, anniversaries engagements to bachelors, bachelorettes and more. 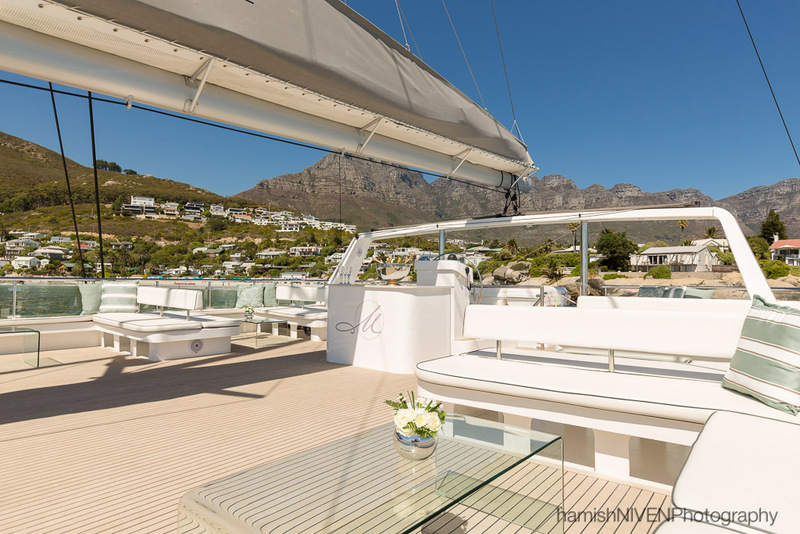 No matter what your event, their more than capable team will help make it a magnificent one, with a private sailing experience on board South Africa’s newest, largest and safest catamaran, with the majestic Cape Town skyline as your backdrop. Impress your guests with the finest in gourmet food and drink pairings from their fully-functioning galley, bars and outdoor grills. Spoil them with a lavishly spacious deck and flybridge, the ultimate in comfort and relaxation. And entertain them with a DJ or live music, and enough exhilaration to set the night alight. Whatever your occasion, your guest list or your budget, our professional event co-ordinators are uniquely equipped to cater to your every need, down to the finest detail. All so that you can enjoy a celebration as unique, as lavish and as unforgettable as the Mirage itself. With its spacious deck and flybridge, open entertainment area, gourmet dining facilities, outdoor grills and two bars, this luxury yacht is the perfect venue for any event you may be planning. Whether yours is a smaller, laid-back celebration or a larger, more energetic affair, your guests will board the in style, and disembark with memories guaranteed to last a lifetime. Experience Cape Town at her finest, from the cool waters of Table Bay to the peninsula’s breath-taking mountain backdrop, and make your next event an adventure in indulgence, excitement, and the ultimate in luxury.